"Know what I mean, know what I mean, nudge, nudge, say no more." The Monty Python boys are responsible for many of the funniest comedy sketches ever filmed. Many troupes have tried to produce comedy with similar wit and impeccable timing, but most have failed miserably. The only one to come close in my book are the people of The State, most of which are now on the shows Reno 911! and Stella, a pair of the few half-hours of hilarity that TV has to offer these days. So many comedians today have the Pythons to thank for their success, as their influential TV series, as well as landmark feature films, have provided some of the most memorable moments in comedy. Eric Idle is my personal favorite among the troupe, thanks largely in part to the youthful enthusiasm he brought to all of his characters, and his ability to keep his comedy stylings alive in television and films for decades following the last Monty Python project. Idle introduces these clips himself, standing near the legendary "Bollywood Hole," where he struggles to remember the members of Monty Python, whose works, he says, will live forever in the "anals" of comedy. Apparently, Idle chose each of these clips himself, and, while it can be very difficult to critique your own work, let alone choose what works best, he has done a fine job. A bit too much time is devoted to the recent footage of Idle discussing his work (albeit in the form of different characters and in very funny ways), especially since the total running time of the DVD doesn't even make it to an hour. Once the vintage clips start rolling, fans will be in heaven, with classic segments including Idle as a quiz show host asking pop culture and sports questions to some of the world's most infamous leaders. Much of Idle's best work, recorded live at the Hollywood Bowl, is also here, including his "nudge, nudge, wink, wink" bit. The clips actually bounce back-and-forth between the TV and live stuff, but the best clips in the entire collection are those involving sporting events. We have the hilarious Olympic footage, as well as the soccer match between the Greeks (including the surprise lineup addition of Archimedes) and the Germans, with Confucius as the referee. The ball is never touched as these philosophers wander around the field, contemplating what they should do. Eric also offers up his own unique version of "The Lumberjack Song," reminds us of the joys of "The Hermit Sketch," and even journeys into the audience during a clip from the Hollywood Bowl performance. He was never afraid to dress like a woman, either, and we get more than a taste of that odd little fetish during many sketches, where, frankly, he makes a pretty good-looking woman. Those of you who own all of the Monty Python's Flying Circus episodes on DVD already might see Eric Idle's Personal Best as a redundant purchase, and, indeed it probably is. However, if you're like myself and didn't want to shell out the big dough for the large episode collections, they don't make "greatest hits" DVDs much better than this new series of hand-picked episodes from the Pythons themselves. Michael Palin's collection is also now available, but I say start with Idle's, or, what the heck, buy them both at the same time. Image Transfer Review: This disc's content is presented in its original full-frame aspect ratio, but it's obvious that the look of these sketches has been cleaned up rather nicely. The clips from the TV show actually look better than the live pieces, but both are much cleaner than they've been, with as little dirt and grain as is possible for such old footage. The colors are muted, but there isn't any bleeding or other problems in that department. Audio Transfer Review: The Dolby Digital 2.0 audio doesn't have much use for wide dynamic range or active surrounds, but what is important here is dialogue clarity, and it never falters. Regardless of the music or other sound effects, the hilarious dialogue can always be heard without annoying interruption. Extras Review: If the hour of footage in the main program isn't enough comedy for you, there are 10 more minutes of comedy in Eric Idle's Personal Second-Best. A lengthy courtroom sketch is among the handful of them that are in this nice little surprise feature. There's also a text-based Trivia Game with questions that were written by Kim "Howard" Johnson. The difficulty level of these is pretty much perfect, especially for die-hard Python fans who would have cringed if they had been any easier than they are. Eric Idle's Biography is just that, as well as a mini-filmography of some of his more notable credits. I'm not a huge fan of TV shows on DVD that aren't released on a seasonal basis, but it's different with comedy, especially when it comes to Monty Python's Flying Circus, which contains individual sketches that can be watched in any order. 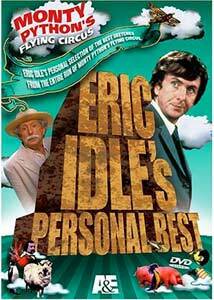 Eric Idle's Personal Best is a wonderful collection of these clips, with A&E Home Video doing a solid job presenting them in nice audio and video presentations, and with some nice extra features as well.